We are so excited to be sharing our new Instant Pot recipes. Stay tuned for our Instant Pot Blog post which is a great introduction if you have not used on before. 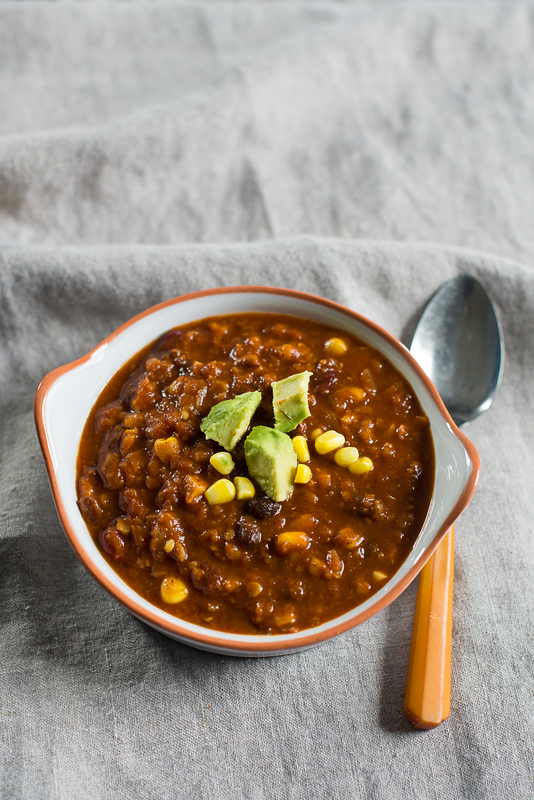 This is a vegan chili that can be made in the Instant Pot or on the stove top. It's really easy in the Instant Pot, as you do not have to monitor the cooking process. First sauté the veggies, then dump everything in and forget it! Add more of the jalepeño seeds and cayenne pepper to make it even spicier! If you like your chili more mild, skip the jalepeño and cayenne. This chili makes great leftovers which are even tastier the second day! Heat oil on "Saute" mode and cook onion, pepper, jalepeño and garlic until soft, about 5 minutes. Add spices, diced tomato, tomato paste, corn, water, lentils and beans. Turn saute off and turn onto "Manual" for 12 minutes. Let naturally release for another 15 minutes before venting completely. Alternatively this can be made on the stovetop. After cooking onion, pepper, jalepeño and garlic until soft, add remaining ingredients and bring to a boil. Reduce heat and simmer for 35-45 minutes. Add additional salt and pepper to taste. Serve in bowls and top with optional diced avocado and chopped cilantro.